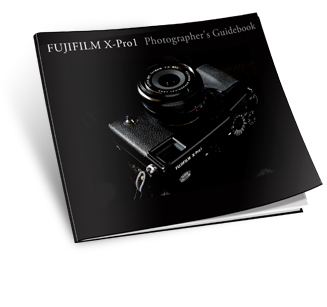 An official guidebook for the premium interchangeable lens camera, FUJIFILM X-Pro1. The Photographer's Guidebook is intended to help users enjoy photography even more with tips on how to use each of the various functions. An interview of photographer Mr.Yoichi Sone and a gallery of his works from Macao. Instructions on how to use the attached RAW file converter. "I often shot using the live view while looking at the liquid crystal display when people were in the shot. You look at the subject's eyes through the viewfinder when taking pictures of people. As a result, the subject is aware of the camera and gets nervous. When you shoot using the LCD, this doesn't happen. It puts some separation between you and the subject instead of you staring directly into their eyes. And this results in softer expressions."